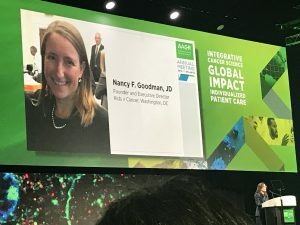 Nancy Goodman, the executive director and founder of Kids v Cancer, was honored as a recipient of the Distinguished Public Service award in recognition of her outstanding leadership in cancer policy and advocacy at the 2019 annual meeting of the American Association for Cancer Research (AACR). The AACR awards recognize groundbreaking, innovative work throughout the cancer community. The Distinguished Public Service award is given to those whose extraordinary work has exemplified the AACR’s mission to prevent and cure all cancers. In its press release, AACR stated that Nancy Goodman, JD, has been an exceptional steward of two significant federal laws that are providing pediatric cancer patients with additional treatment options. Goodman was a champion for the Creating Hope Act Rare Pediatric Priority Review Voucher Program, which provided significant incentives for pediatric rare disease drug development. She also advocated for the RACE for Children Act, passed in 2017, which ensures that all cancer drugs in development may now also be tested for use against childhood cancers by allowing the FDA to require pediatric assessments of drugs under FDA review when the molecular targets in question are also relevant to pediatric cancers. She serves on a number of committees including the AACR Pediatric Cancer Working Group, the National Cancer Institute Board of Scientific Counselors, and the Stand Up To Cancer Scientific Advisory Committee. Kids v Cancer applauds two other Distinguished Public Service award winners this year. Dr. Daniel D. Von Hoff, physician-in-chief and distinguished professor at the Translational Genomics Research Institute; professor of medicine at Mayo Clinic; chief scientific officer and Virginia G. Piper Distinguished Chair for Innovative Cancer Research at Honor Health Research Institute; and professor of medicine at the University of Arizona College of Medicine, received the award for his extraordinary clinical research career and leadership in establishing the AACR/ASCO Methods in Clinical Cancer Research Workshop to educate and train young clinical investigators. Dr. Louis M. Weiner, director of the Georgetown Lombardi Comprehensive Cancer Center; professor of oncology and chair of the Department of Oncology at Georgetown University Medical Center; and director of the MedStar Georgetown Cancer Institute, received the award in recognition of his extraordinary career in the field of cancer immunology and immunotherapy and for his contribution and proactivity in establishing the AACR Cancer Immunology Task Force and AACR Cancer Immunology Working Group.